Providing the best blend of creative design, flexible manufacturing capability, and competitive product cost, to achieve your optimal product application solution. From modification of existing parts to completely new we can handle a wide range of your plastic molding requirements. We work together with you to find the optimal product application solution as we consider the best blend of part design and competitive cost. Find Solutions, Save Money, and Gain Valuable Time! Use our design and production expertise and work with us to find a product solution that utilizes an existing AEH standard product. Many existing AEH standard parts are built with segmented (insert) tooling which makes these modifications possible. An almost infinite number of additional product possibilities can be turned into reality with modifications such as: varying the spacing length, designing/substituting a different size or style of arrowhead/mounting device, or by adding a unique/application specific design that meets your needs. And we can consider running many standard AEH parts with special alternative materials to meet your application needs if volume and tooling compatibility criteria can be met. In addition to the lower tooling costs, lead times can be shortened significantly. To talk about specific product and applications please call us at 1-800-778-7234. Parts can be modified to handle different hole sizes, different board thicknesses, and special applications. Subtle modifications can be made to handle specific application needs. Wire saddle shown with and without locking feature. 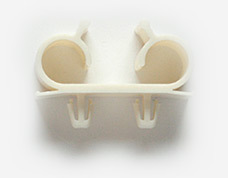 One of the fastest growing segments of All Electronics Hardware is the design and manufacture of custom plastic parts. AEH brings many years of engineering design and manufacturing expertise in both injection molding and plastic extrusion. We can work with you to find the best solution for your application requirements while working within your budget. A large OEM customer (Fortune 100 company) came to us with an application in search of a practical solution. Our customer needed to manage multiple numbers of large cables in a very active work environment. They needed a part that could manage large cables securely while the base of the part was snapped into a rigid metal platform. But the required part still needed to offer the flexibility for the cables to be removed and reinstalled repeatedly in the very active and space-limited work environment. The part needed to retain its functional memory while standing up to the rigors of the cables being removed and reinstalled. Our AEH design and engineering team created the part below that met and exceeded both the application and cost criteria desired by our customer. Side view of the Snap Mount Double Clamp. Photo of the Snap Mount Double Clamp (actual part). Answer: Call us at 1-800-778-7234 or contact us via e-mail. We can draw upon our many years of plastics industry experience to help you clearly choose the right AEH product considering all important elements of the planned product application including available space, external environment, expected longevity and total cost.